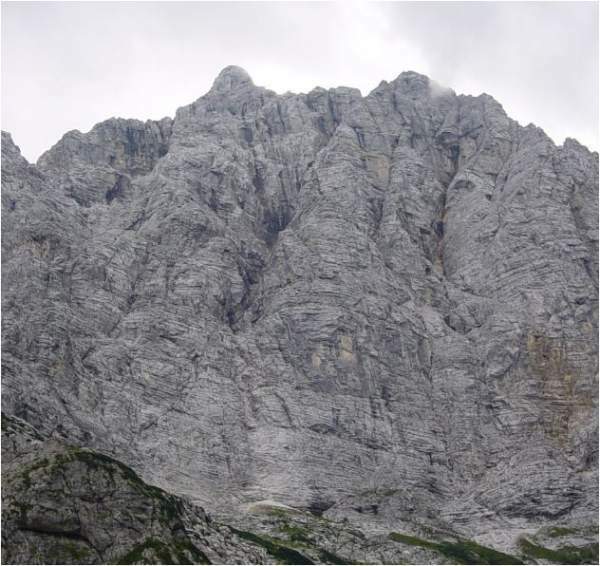 Climbing Mt Triglav in Slovenia has always been my dream from the moment I saw the massive from the road which leads from Jesenice in Slovenia to Villach in Austria. So indeed, later I climbed it, but my first climb took place thirty years ago. This was long before digital cameras, in fact, I did not have any camera with me. Therefore, I have no trophy photos to show. Those a few that you see here are from some other occasions, I do not have any to show from the climbs. But, I have my rules for this site: I do not borrow photos from the Internet, all that I show must be the first-hand experience. I am writing this text from memory. Regarding the climbs, I think I remember most of it. This was my first big mountain, so I guess this is why I remember it so well. But there are details from transport and access stages which are not so fresh in memory, though they are not so important after all. Triglav height: 2864 m (9396 ft). Triglav in the distance, view from the summit of Mangart. Here is a short summary regarding the general equipment (G), for the Tominsek route (T), and for the Bamberg route (B). Note, this is for the summer time only, assuming that there is no snow on the route, otherwise: i) do not go, or ii) if you have to, bring an ice-axe and crampons as well. For the clothing in the Alps in general, please see my another text. 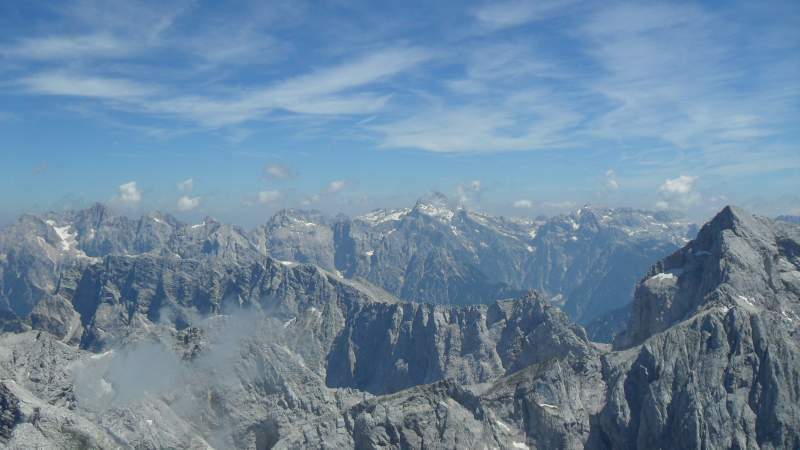 The height difference from the Aljaz hut (1015 m) to the summit is 1850 meters, this is huge, bear this in mind. This is the reason why many routes in the Slovenian Alps, or in the lower Alps in general, may be far more demanding than climbing some 4000ers in the Swiss Alps. You simply have to start from a low altitude, there are no mountain passes with a high car access (but see my Mangart story), and there are no lifts (which I would not use in any case as this is very much against my ‘mountaineering religion’). I was supposed to go with my friend Vladimir Cadez, a colleague physicist from the Institute of Physics in Belgrade. We made a plan to meet in Ljubljana, and he was supposed to be accompanied by a colleague from Belgium. This was after a physics conference which we had in Belgrade. So after the conference, they went to see Ljubljana and my plan was to join them there on our way to Triglav. Vladimir climbed the mountain some 13 or 15 times before that, so he was supposed to guide us. However, I missed the planned train from Belgrade, and I took the next one. In Ljubljana, they were not at the train station, so I assumed they already left. I took the first train to Jesenice, and from there a bus to Mojstrana. From Mojstrana, well I do not remember exactly, I think there was a bus which took me up to some point in the direction of Aljazev dom (Aljaz hut). Triglav as seen from the main road. This is similar to how I saw it for the first time in my childhood and got a desire to climb it. I should add that on the train there was a group from Zagreb going in the same direction. I realized this after seeing their mountaineering equipment. So from Ljubljana, we were going together all the way to the Aljaz hut. We were at the hut around 5 pm. I looked around, and my friends physicists were not there. So again, I assumed they left towards Kredarica hut. Now you guess what I did, right? Yes, I said goodbye to the group from Zagreb, they would stay the night in the Aljaz hut, and I started my climb shortly after 5 pm. I guess no sensible person would ever do this, but hey, I am not in that category. To realize how stupid this was you should know the following: I never visited the Alps before that, I had no idea about routes, I never saw a map of Triglav, and above all, I did not have a torch. Should I add, I also did not have any waterproof clothing. So you get the picture: a complete idiot in mountains, a recipe for disaster. I did have rather good hiking boots by Sloveniasport (you would not believe, I still have them but have not used them for decades), and an external frame backpack from the same company. Soon after the Aljaz hut, I saw the signs for Tominsek route, so I assumed this was to be followed, and indeed I was right. This is a ferrata route, there are many sections with fixed cables and chains, and many exposed passages. If you have problems with vertigo, better not go that way. Somewhere on the route, you might see red sings “zavarovana plezalna pot”, which is Slovenian for ‘via ferrata’. According to the signs, you need 6 hours to get to Kredarica hut, I did it faster, see below. The beginning through the forest was very pleasant, but after one hour or so, I was above the tree line, with a pure rock after that, but the night was coming. If this was not enough, clouds were gathering around, so it was becoming dark sooner than usual. It started raining after that, but nothing serious, otherwise I would be in a real trouble. There is one point with a tiny water source coming from the rock, so I refilled my bottles and continued. After that there were no exposed sections, I saw signs for Stanich hut which was somewhere to the left, but I continued by following the signs to Kredarica hut, assuming that my physicists were there. All in all, by some miracle I arrived at the hut around 10 pm. Do not ask me how I managed it, I have no idea, it was totally dark outside and I simply cannot explain how I managed to follow the route. Now guess what: my friends physicists were not there! So what to do, I stayed the night there, and at dawn, I decided to continue solo to the summit. I described one short episode from the hut in my another text, so you may have a look there. When I was out of the hut, I could see groups of climbers in the rock leading to the summit. Frankly speaking, I was shocked, it looked very steep from my stand point and I was really concerned. But I just continued. There are many exposed passages here, this is a ferrata section again. The summit ridge which followed after that was quite scary. There was a huge crowd on the summit. One guy was playing accordion, some people were singing typical Alpine songs, a wonderful atmosphere. I descended the same way to the hut, and after that, I continued by following the Prag route. Surprisingly, on the half-way down, I met the group from Zagreb. They were climbing slowly, but they obviously enjoyed the tour. Do not remember when exactly I arrived at the Aljaz hut, but I did not stay long and just continued walking all the way to Mojstrana. I think this was some extra 10-12 kilometers, so imagine, this was a walk directly from the summit of Triglav. Dead-tired, I managed to get a bus to Kranjska Gora and from there by train back to Ljubljana and to Belgrade. So, this was my first solo express tour of Triglav. I did not plan to do it so fast, but as you realize, I was chasing ghosts on the mountain. This climb was again related to a conference, three years after my first climb. I was at ICTP in Trieste, and I had a car, so I made a detour on the way back and continued towards Mojstrana. After spending the night in the car, I started my tour around 5 am. 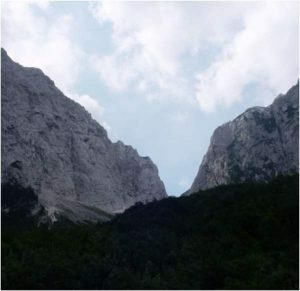 View from Vrata valley towards Luknja pass. The plan was to go to Luknja and then to follow the Plemenice route, also known as Bamberg route. Luknja is a narrow pass at some 1760 meters of altitude, between Triglav massive on one side and Pihavec (2419 m) and Bovski Gamsovec (2392 m) on the other side, see the photo. 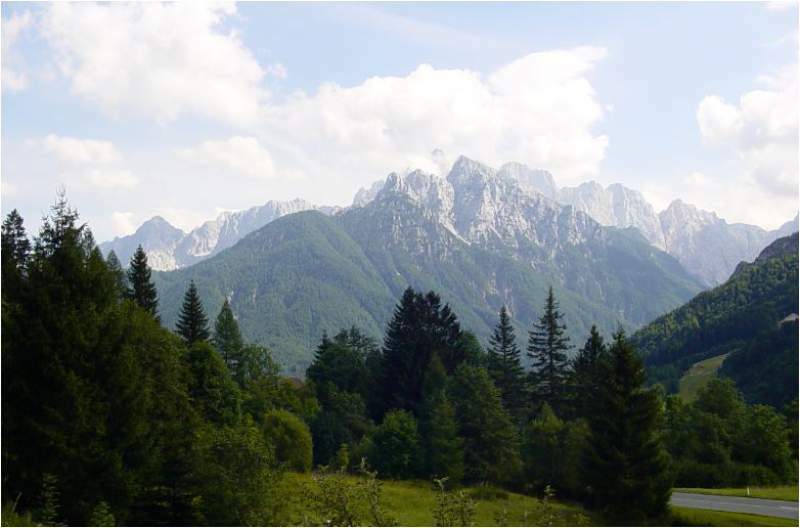 This is all the part of what is known as the Triglav National Park. I was there before the sunrise. It was a spectacular moment at Luknja; there was a fog on the other (southwest) side of the mountain, but it could not pass through the narrow Luknja because of some air streams from the northeast side. So the fog raised all the way up and it looked as if Luknja was just a stone wall in front of me. I started the scramble on the left, towards Triglav. Do not ask me for timing or for many details about the route. All I remember is that this is a steep scramble and ferrata, with many breathtaking spots and quite a few exposed sections. At some points, you get to the edge of the Triglav’s north face, and you can enjoy the full beauty of the Vrata valley far below you (sorry, no photos to support this). 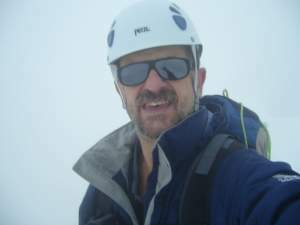 I did not have any Ferrata equipment, the same backpack, and boots as in the first climb described above. The part on the Plemenice is a rather pleasant passage and not steep at all, and you pass it before the final steep push to the summit. As for living creatures, I only met a few Alpine goats on the way up. Oh yes, there were a few small groups before getting to Luknja, but they were moving so fast that I never saw them again. They only made me feel miserable. From the summit, I descended towards the Kredarica hut, and from there continued along the Tominsek route. I knew it was far more exposed than the Prag route, but it looked shorter and less annoying. I was at the car parking exactly 12 hours later. Without wasting time, I continued driving back to Belgrade. It was a long night after that. Thank you for reading. Have you ever been there? I shall be happy to hear from you, there is a comment box below. Have a nice day.